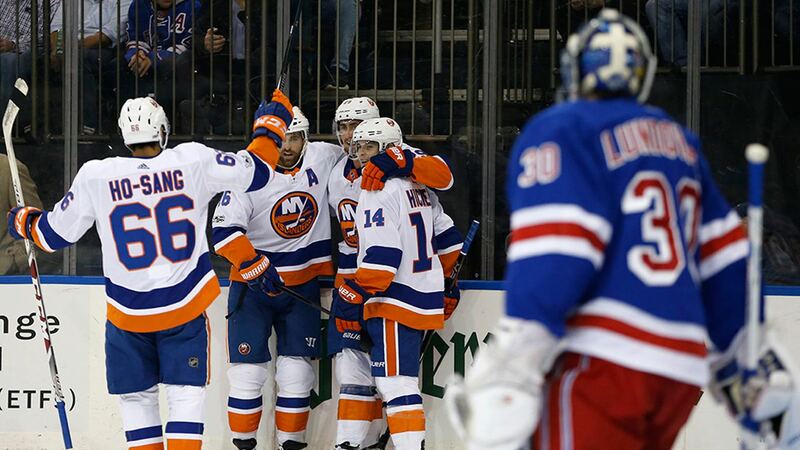 NEW YORK (WABC) -- The Islanders notched their third win on the season by defeating the Rangers 4-3 in a shootout at Madison Square Garden. Before the Rangers took on the Islanders Thursday night at Madison Square Garden, they had only one win in the first seven games of this young season. To go into a total panic mode is a bit too early, but if this start is any indication, the fury is not far behind. The Rangers start to games have been flat, and Thursday night was no exception when Andres Lee scored on the power play, just under three minutes into the game. David Desharnais would tie it up two minutes later, but the Islanders retook their lead with Brock Nelson's fourth goal of the season a minute later off a turn-over. This Rangers team is far too vulnerable, and with a lack of confidence they seem inept to recover. The second period followed the Rangers dispirited starts by letting up a goal with just over a minute into the frame. Mathew Barzal scored his first career goal to give the Islanders a commanding 3-1 lead. Beating Rick Nash along the boards, and squeezing a goal past Lundqvist that he should have stopped from going into the net. In the third period, it was the Rangers who came out with emotion, and played very aggressive. The Rangers were the benefactor of a third period turnover by the Islanders Anders Lee, that landed on defenseman Brendan Smith's stick. Lee feverishly retrieved into the defensive zone and blocked Smith's pass, but trailing the play was Mats Zuccarello who buried the puck past Jaroslav Halak to get the Rangers back into the game trailing 3-2. After having a goal waived off, Kevin Hayes answered back with an end-to-end goal on the back hand to tie the score at 3-3 with just under six minutes to play. The Garden faithful came alive and rallied around their Blueshirts. In the final seconds of this tie game, Josh Bailey was stopped by Henrik Lundqvist on two spectacular saves. This game could not be decided in overtime, and had to go to a shootout. John Tavares scored the deciding goal in the second round of the shootout, leaving the Rangers at the bottom of the Metropolitan Division. Afterwards a dejected Henrik Lundqvist said; "It's too many games where we give up the first goal." Lundqvist added; "I've gotta be better as a group we gotta be better." Brendan Smith added; "There's always room for improvement." Smith added; "As a club it's still early, but there's areas where we can be a lot better." The Rangers next game is Saturday afternoon against Nashville at Madison Square Garden. Face off is set for 12:30 p.m. Meantime, the Islanders take on the Sharks Saturday at 7 p.m. in Brooklyn.